There are a million ways to file paperwork. One that I sometimes see is the use of binders. It’s not a system that I would use (that’s why there are a million ways to file). You’ve got to find what works for you. It works for some people and is an excellent option for some types of paper (in my honest opinion). Using a binder makes use of the sorting system, where you group similar types of paper together – say all your statements from a financial institution together in one place. 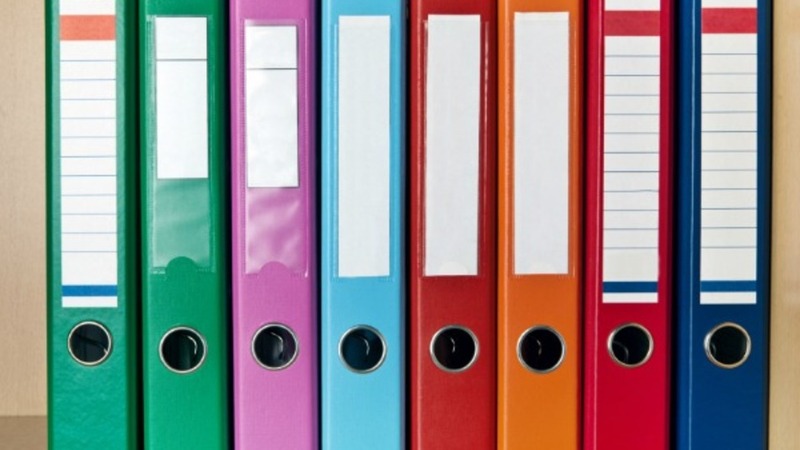 By placing the latest (and greatest) statement in the front of the binder you keep things in chronological order and by clipping the binder rings closed you ensure that they will stay together. I guess what I don’t like about this type of system for certain kinds of paper is that you have to pull out the whole binder to find something. That can be a lot of weight to lug around. When would you need to see paperwork from the past? Binders, though, can keep you honest if you use the size of the binder to be your limit as to how much paper of that type you keep. The rule of when the binder gets full you have to shred the oldest documents is a good one. One cheating by getting a second binder for those docs! When is a binder is appropriate. Again, in my honest opinion, medical documents for someone with a chronic condition is a good candidate for using a binder. That way, everything is contained so you can take it to each doctor’s appointments and be able to refer to when asked a question by a physician. You do have to be diligent and update all the documents. Another good use of a binder is if you collect recipes. Using a binder, tabs and plastic sleeves, you can make your own personal cookbook, with recipes that you pull from magazines or print out on the internet. I still like looking at a printed recipe when cooking, as opposed to a screen. But I’m still not a binder-user. Have you ever though about using a binder to collect your kid’s artwork? This is a great idea if you start young and have the binder ready to go when they bring home all those pre-school paintings. By being proactive and setting up a binder for each child you are ready with a home when the items walk in the door and they don’t become clutter on the kitchen counter or frig. How do you use binders? Send me your ideas. I have a bill paying binder. I keep the latest statement for each of my payables in a plastic sleeve with handy un and pw information plus any origination paperwork (eg. insurance policies). Great idea Anita. Whatever works for you. It sounds like you are a visual person and like being able to see everything. Great advice! Binder organization only works for certain people, but I can see your point. I like how clearly you can organize a lot with binders. Thanks for sharing! Thanks for the comment. Yes. Binders work for some people very well and others don’t like them. Organizing is a personal exercise.